When you lose your spouse’s respect, your relationship continues to deteriorate. You can regain that respect and get more love at the same time. If you feel like your spouse looks down on you, he or she probably does. Your spouse may either try to control you or make you feel inadequate. He or she certainly won’t make you feel loved. What you used to think of as a wonderful partner is now becoming someone you don’t look forward to seeing. What happened? 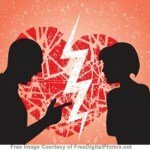 This commonly happens after partners have done something very damaging in the relationship. In an effort to try to make up for it, they allow their spouses to treat them badly. They may feel like they deserves it for their mistake. Their spouse also feel that way. Unfortunately the spouses are likely to treat them more badly as time goes by. Allowing someone to mistreat us, always breeds disrespect. It doesn’t even the score. People can become fearful if they have a history of rejection. Such early experiences can make a them fearful of losing yet another person, so dear to them. So, they don’t use any boundaries. They are patient. They become “yes dear,” kinds of partners, no matter how their husbands or wives treat them. In the end, such needy behaviors make them resentful and unattractive. Needy people are far more likely to lose their spouses than secure people. Here’s how to find out if you are needy. If your spouse not only disrespects you, but also his or her family members, you have married a disrespectful person. These people are nice enough when they want something. They will also connect well if everything is going their way. But, if they don’t get what they want, watch out! When you get on their bad side, they may utterly reject you. They will blame you for everything from bad weather to politics. Here’s what you can do if you are blamed for everything by your spouse. If you like to do things your spouse would never do, he or she will look down on you. After all, you can’t both be right. Right? For example, if your spouse likes to save for retirement and you like to spend everything on wild living. Or, if you go out with your friends often while spouse is a homebody. Or you spend little time with the kids while your spouse spends a lot of time with them. Exactly when is respect lost? Respect is lost from the first time that you allow your spouse to mistreat you or damage the relationship. If your spouse is using his or her cell phone at the dinner table for the first time, you might not like it, but let it slide. The longer it goes on, however, the more your spouse will feel entitled to use the cell phone at the dinner table. If you complain about your spouse’s behavior, you will at first be given excuses. As you complain more about it, you will be told that you are controlling. In your initial effort not to make waves, you let something go on to the point that your spouse no longer cares what you want. That is loss of respect. Other examples: cell phone secrecy, staying out without calling, lies, name calling, nasty sarcasm, and diagnosing you. These behaviors erode the love in your partner as well as yourself. If it goes on long enough, there will be no love left for either of you. Part of learning to build respect, is learning to stop both protective thinking and reactive thinking. Protective thinking is like, “What do I need to do to keep my partner from getting upset?” This kind of thinking prioritizes short term peace. But it does so at the expense of long term loss of love and connection. It is characteristic of avoidant people, who fear conflict. It is also true of needy people, who fear abandonment. When treated with disrespect, protective thinkers often try to defend themselves. No matter how much they explain however, it only gets them more disrespect. This is because explaining is a needy behavior that rewards, rather than stops, bad behavior. Protective thinking keeps people from demanding respect in the first place, when it would do the most good. They let the disrespectful behavior go on and on until they can’t suppress their feelings any longer. Then, they either explode at their spouse or withdraw into depression. Both are relationship killers. Using protective thinking is like failing to put out a little fire until it becomes a raging blaze. If you are going to do something, it’s always best to do it as soon as you can. Using reactive thinking is like trying to put out a fire with gasoline. Two outcomes are possible. The reactive person either emotionally beats their spouse into submission, or provokes reactivity in their spouse. Both ways lead to loss of love and an eventual end to the relationship. Neither protective thinking nor reactive thinking can get you the respect which is vital for your relationship. The alternative to protective thinking and reactive thinking is proactive thinking. Proactive people very deliberately work to build love and respect over time, rather than reactively, all at once. The process is remarkably similar to good parenting. We don’t try to get our children to make instant changes by being very severe. That would damage our child’s self esteem and our relationship with our child. Instead, we love and nurture our children while putting into place reasonable boundaries. We never, ever, reject our children. Neither should we do that with our spouses. We work to foster love in our relationship with our spouse. At the same time we maintain line that cannot be crossed. That results in a close and secure marriage. Having a healthy marriage without personal rules–without boundaries–would not work any better than parenting without boundaries. Some people only need to work on one of these, while other people need to work on all five. Like communication and cooperation, I have never heard anyone regret having spent time working on getting more respect. Note that all of these things are done by the person who is being disrespected. You can spend years trying to get your spouse to change, or you can make changes in yourself that earn respect. By working on what you do, you can put both respect and love back in your marriage. Separate the person from the behavior. 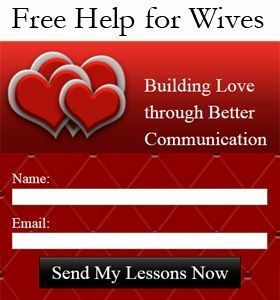 Continue to give loving messages to your spouse, while limiting the damage caused by the behavior. For example, if your spouse is misspending money, you may need to have a separate bank account. 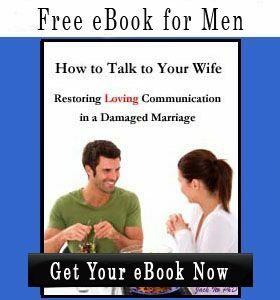 But, you can communicate that you love your spouse and treat your spouse well. There is nothing about boundaries which require us to be nasty or have a bad mood. Suppose your spouse regularly comes home late to dinner. Is that your problem or your spouse’s? If it is yours, then you need to do something about it. If it’s not, then you don’t. I suggest that you let it be your spouse’s problem. Put his or her dinner in the refrigerator, and greet him or her with a hug or a kiss when he or she does return home. You don’t need to be stressed out because your spouse is coming home late, and you can help to keep your relationship strong. If you made it your problem, then you would feel you need to somehow correct your spouse. This would mean complaining and blaming. Rather than fixing the problem, you would become more distant from your spouse. Just as people have different love languages, they also have different motivations for their behaviors. You have to take them into consideration if you are going to attract and motivate your spouse. Some spouses want to get things right, some want to get things done, some want to get attention, and some just want to get along. 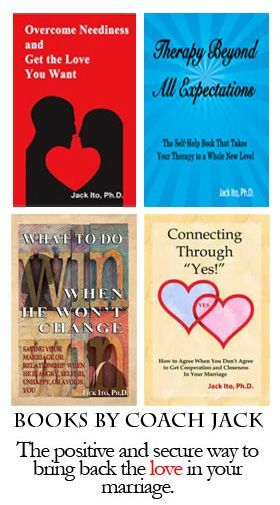 As I wrote in my book, What to Do When He Won’t Change, there are specific ways to approach each of these four personality types that results in less conflict and more love. If you take into account those two things, you will be more effective at building both love and respect. It is possible that your attempts to be loving will be rejected and you will continue to be mistreated. In that case, your spouse has lost the desire to reconnect with you. 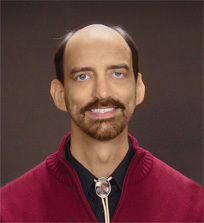 Professional coaching on restoring love with difficult spouses will help put you back on track. There is no need to give up or live with disrespect. When there is respect and love, couples end up desiring to be with each other. The basic desire that makes us want to have a relationship in the first place is the desire for love and acceptance. If our spouses are disrespectful, we have played a part in failing to earn their respect. We can change that. We may wish that our children or spouses will just respect us out of the kindness of their hearts, but that’s not the way it works. Love is given. Respect and trust are earned. Thousands of my clients have been able to regain respect and restore love. If they can do it, what’s to stop you from doing it, too?